Charge multiple devices simultaneously, while only taking up one power outlet. Exclusive PowerIQ Technology: Detects your device to deliver its fastest possible charge speed up to 2.4 amps per port or 8 amps overall. Max speed charging for our multi-device world. Australian power cable included. Most chargers are just that - chargers, and pretty much all they do is provide a very basic feature. Not the PowerIQ technology on this smart charger! This charger contains six ports, meaning you can pretty much plug in any device you own: making it an Apple charger, an iPhone or iPad charger, use it for your Samsung Galaxy, your Samsung Note Products, Toshiba pads, smartphones, virtually anything you can imagine! Furthermore, after you plug in any device, the PowerIQ maximizes the ultimate charging rate that you need to safely charge any device you own as fast as possible. Most manufacturers go out of their way making their devices unable to charge different devices so that you have to buy a new charger for ever occasion, but not the PowerIQ device. It's been designed to quickly charge any device, whether it's from Apple, Samsung, any other Android device or Chinese electronics, and works to power it in the highest rate possible matching your device and providing the best service for your device possible. Use the PowerIQ device in your office, at your home, as a family charging station on your kitchen table, or make it the one device that you carry with you on vacation to charge EVERYONE'S device. No more struggling to find the right charger, or getting all your cords mixed up- carry one charger for everyone's devices. All you have to do is simply plug your device into this charging wizard of an AC wall charger adapter. 60 watts, 12 amps, 6 charging ports, AI intelligence with PowerIQ's patented device detection abilities, all in one tiny pocket sized device case that goes exactly where you do, doing anything you'd ever want it to. As soon as you plug it in, it goes to work, with the PowerIQ feature automatically identifying and connecting to your devices, independently powering various outputs for each device simultaneously without ever missing a beat. 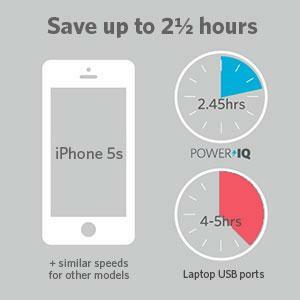 It can do it all, saving you at LEAST an hour and a half off of each individual charge time - for a Galaxy S5, S6, iPhone or even 5 hours or more off of the charge times for an iPad Air 2. Fully certified like you would expect any powerful charging device should be, this Anker charger is fully certified despite the power capabilities that it provides, going the distance with high-quality circuitry, overload recovery and maximised surge protection all in one slim, current-limiting power charging device - you're in good hands. Which USB Charger should I chose? Anker PowerPort 10 - 60W 10-Port USB Desktop Charger - For charging up to 10 High-draw or low-draw USB devices. Supports up to 3 Amps per socket. All it takes to maximize the speeds of your device is a thick-high grade, high gauge USB cable just like the PowerIQ Dual Super Fast-Charging Micro USB Cable. PowerIQ: Detects your device. Delivers the fastest charge. Not all charging ports are created equal. Standard ports only charge some devices at full speed and others often really slowly. But with PowerIQ technology, each port intelligently identifies your device to deliver its fastest possible charge speed. Saving you hours of time. This charger meets the rigorous testing and safety standards of Underwriters Laboratories. State-of-the art chips and industry grade materials give you superior performance and reliability. We’re so confident in the quality of Anker products, we back them all with an 2 Year Warranty. Use your device’s original cable or a third-party certified one (such as MFi). Compatible with all Apple and Android smartphones, tablets (including the Nexus 7) and other USB-charged devices. The iPod nano, iPod Classic, HP TouchPad, LG G2 and Asus tablets are not supported.